I often see this image in VK, OK and Facebook. I can't understand this F#m8b12b#8 chord! I know it's a taunt of a kind but does it really exist and what notes are those and how to play it on Guitar and Keyboard? 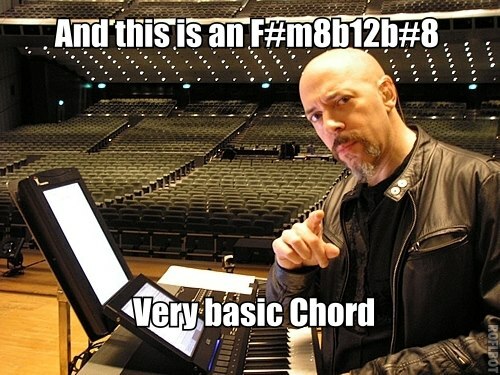 F#m8 doesn't make sense because 8 is the octave, so it doesn't add anything to the chord. b12 doesn't exist; the 12 is equivalent to the fifth, which is a basic chord tone, so if it should be flat, it should be a b5; however, this contradicts the F#m chord, which as a perfect fifth; there can only be one fifth; enharmonically, the b5 could be a #4 (#11), so if you wanted to add that note, it should be a #4 (#11). Note, however, that this tension is very uncommon in a minor chord. What is the full list of possible chord names? Are there chords that don't have a name in chord theory? How important is it for a guitar player to know the notes which make up a chord? What is this Chord Notation? How to automatically create guitar chord diagrams for site? Is there a key change in this chord progression? How do I choose the type of chord for an specific scale? How was the D chord constructed?